Happy Anniversary Ms Traveling Pants! Since 2008, it has been quite an adventure. With now nearly three hundred posts of good times and good stories, this adventure travel blog has grown. This year alone, I have added many places, activities, and feathers in my hat. 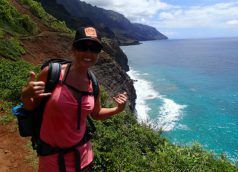 Hiked the Kalalau Trail on the NaPali Coast of Kauai.